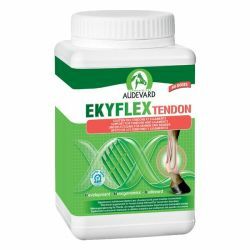 EKYFLEX TENDON is a complemenary feed formulated by AUDEVARD Laboratories. It is designed to provide nutritional support for horse's tendons and ligaments. The primary characteristics of tendons and ligaments—an alliance of delicate fibres subject to significant strain during exercise—are strength and elasticity. In the event of a tendon injury, the challenge for veterinary surgeons is to encourage the formation of scar tissue rich in type-I collagen, which has unique strength and elasticity, so as to minimise the risk of relapse. These critical periods require specific nutritional support. The EKYFLEX TENDON formula combines three specially selected plant ingredients: Centella asiatica, fucus and bromelain. It is also enriched with vitamin A and zinc. Users, particularly trainers, like having a nutritional solution for their sport horses that does not contain any ingredients that could lead to a positive result during anti-doping tests. 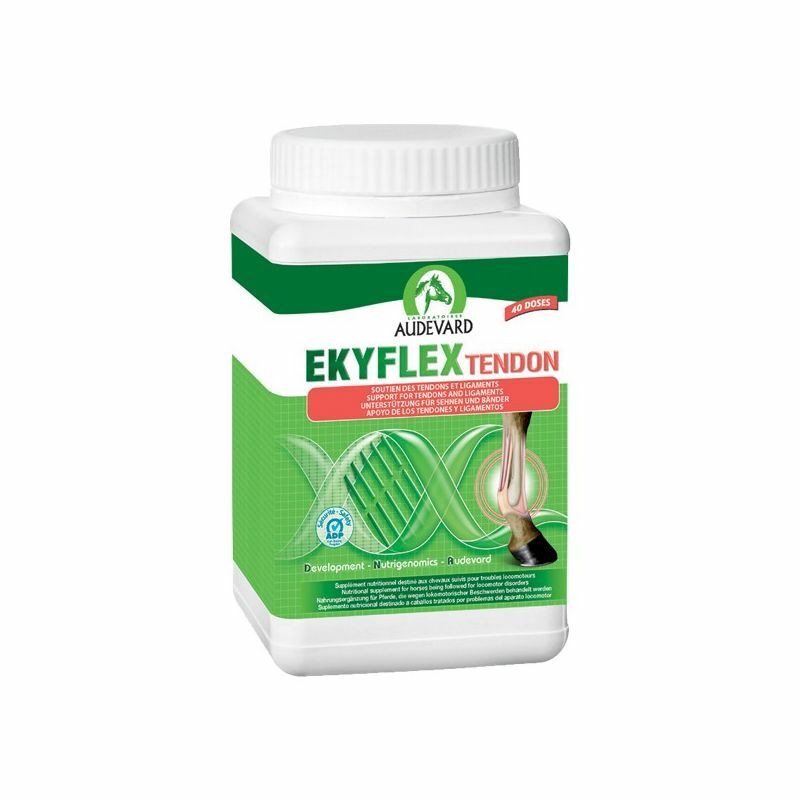 The earlier EKYFLEX TENDON is used after an injury, the more the tissue benefits from the nutrients. EKYFLEX TENDON is also suitable for training horses with especially sensitive tendons. Don't wait until the damage is done! 600 g box - Sufficient for up to 20 days' use in adult horses. 1.2 kg box - Sufficient for up to 40 days' use in adult horses. Nutritional support for a horse’s tendons and ligaments. Daily allowance : 1 measure= 30g / 1 to 2 measures per day for 30 days. Repeat as required over 10 to 12 weeks. Raw materials : Lithothamnion, molasses sugar beet, Fucus (Fucus vesiculosus), Alfalfa (Medicago sativa), Carob, Bromelain, Centella asiatica ; Additifs: 3a-Vitamins, pro-vitamins and substances with similar effects: E672 Vitamin A 58,333 IU. 3b-Micronutrients: E6 zinc (sulfate monohydrate) 1700 mg ; Constituants analytiques: Humidity <10%, crude proteins 5%, crude bres 7%, crude fats 4.4%, crude ashes 40%, calcium 15%, sodium 0%.